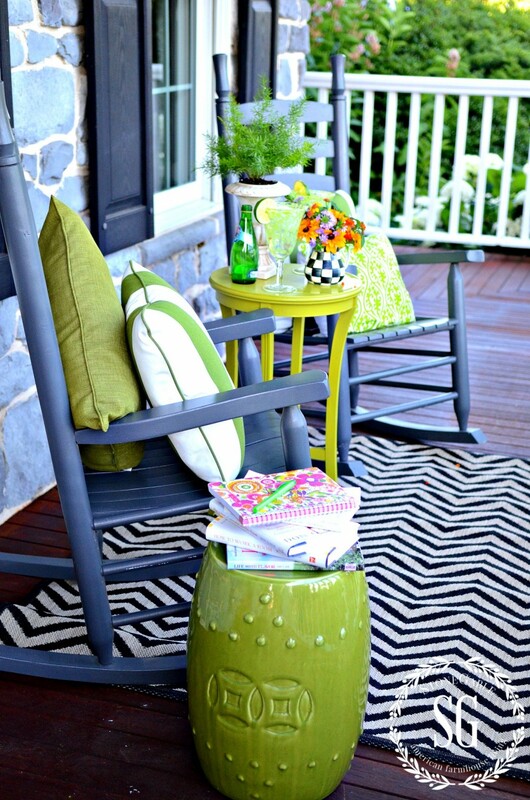 It’s time to get our porches, patios and front door stoops ready for outdoor living! Yea! Wouldn’t it be wonderful to have a clean and well decorated area to enjoy the upcoming late spring and early summer! Now’s the time to do little things to an outside space to make it a fabulous outdoor living area! Here are 8 tips to work on now for a great outdoor space you will love spending time in! Start now to wash down patio furniture and porch rockers. At my home this is a weekly occurrence! My favorite solution for my furniture and rockers is a 2 TBS Pinesol in a bucket of warm water. After a good scrub I hose them down. I dry down my rockers so they don’t get water spots. A bistro dining area, a summer reading spot or a nice place to swing and count the fireflies are all examples of fun spaces to create outdoors! Do you like to get up early and read the paper with your cup of coffee. 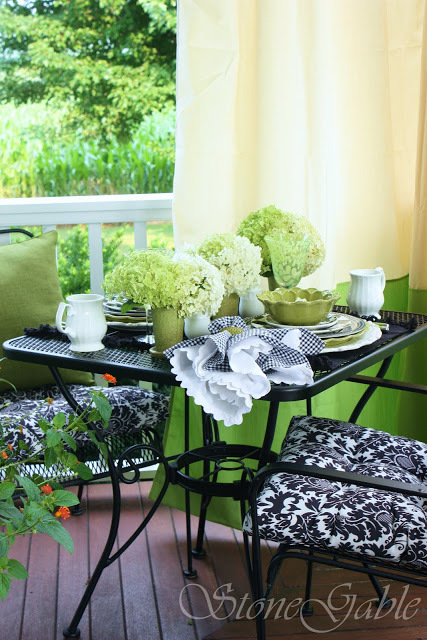 Why not create a little space outdoors to enjoy your morning ritual. Make is special! 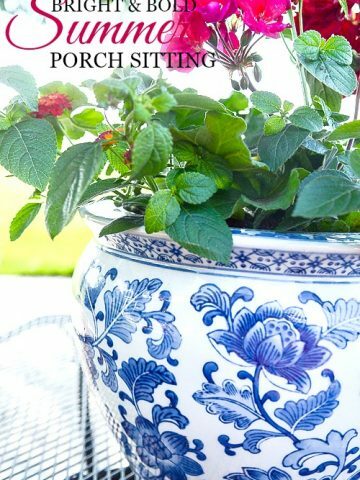 If you start now and do a little at a time, your porch, stoop, patio and deck will be ready for you to live outdoors all summer long! What will you incorporate into your outdoor living space this year? Please share! Remember to pin this to your Pinterest PORCH, PATIO or SUMMER board. 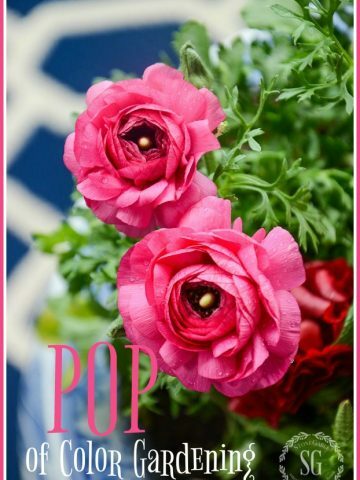 You can follow me and see all the great porch things I am pinning HERE. Great ideas as usual! I would love to plant some flowers this spring and find a couple of rocking chairs. All I have so far is a nice rug! I need to get busy! Love your outdoor living space. You have given me some great ideas. Thanks. Thanks for posting these different ways I can improve the look of my patio. 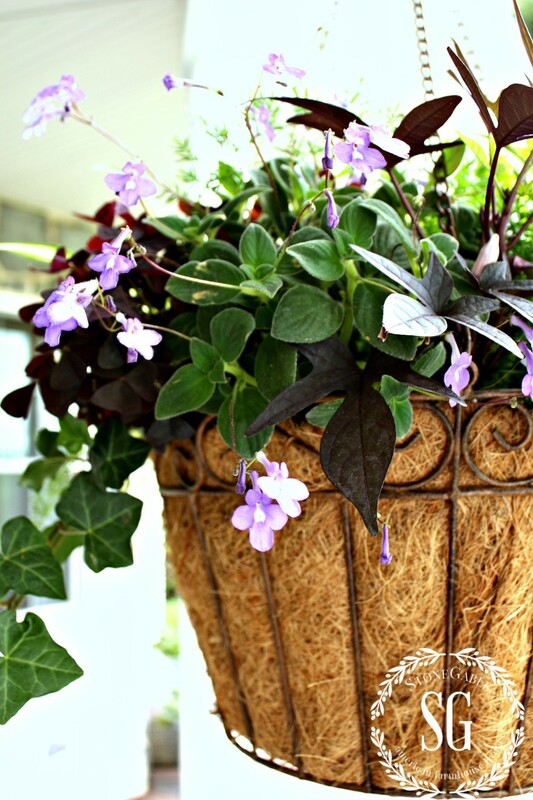 I want it to look really nice for spring, so this guide will give me a better idea of how I should decorate it. Adding rugs and potted flowers seems like they would make great accent pieces. I’m going to have my wood stained in a few weeks, so having accent pieces would help draw attention to the lovely stain that I’ll use on my wooden deck. These are some really great ideas. It reminds me that we haven’t painted our patio for some time and you’re right, it really would make it look so much more fresh. I’m sure even my husband wouldn’t mind a fresh coat of paint out there! Thanks for sharing these. LOVE the color palettes you’ve chosen! Gorgeous, bright yet sophisticated fun! I love your style! The rockers with that sweeeet green table is too adorable! I too think long outdoor curtains are so elegant. I definitely want to add those to my pavilion. Everything is just lovely! Thank you for sharing these photos. 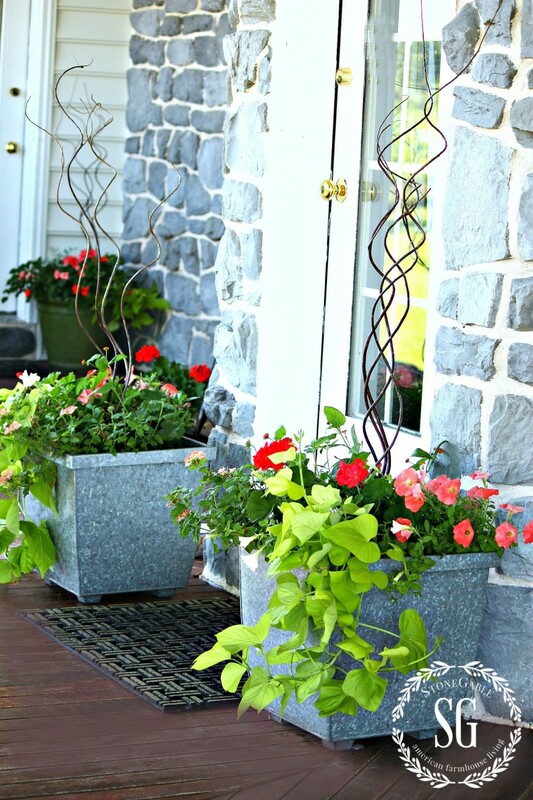 Great ideas and your outdoor spaces are lovely, Yvonne. Thanks for your tips! Just the prod I need to get winter grim scrubbed away! I have a question about your outdoor draperies: do you wash them in washing machine or with hose outside? How often? Thanks for your special connection to your readers! You really do inspire me in so many ways! As always, so beautiful. Just sitting with my dog sipping my coffee. Just wanted to let you know how relaxing it is to read and view your posts. 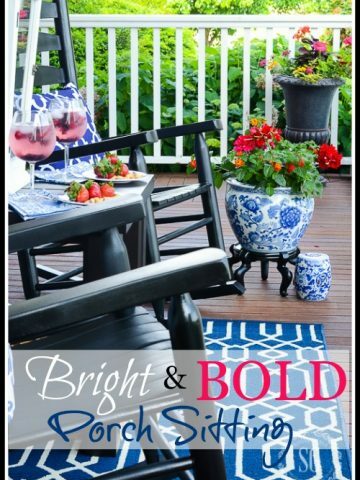 I will be inspired now to work on some of my outdoor areas. I admire how you do themes! Beautiful porch pictures. Thanks for the tips Yvonne…..your porches are always so gorgeous….I am just starting to fluff mine up for Spring….we are experiencing horrible pollen now and the porches are covered with yellow dust….as soon as I hose down the porches, the dust is back!…So hopefully it will all be gone soon and I can take your inspiration and dress my porches! Which Mac Kenzie-Childs is the pitcher you are showing on the entrance? What lovely photos! Great tips also, but then again, you always have wonderful ideas 🙂 Thank you so much for sharing! Have a great week! Love your space. Hopefully pollen almost gone so i can get our porch and deck cleaned and ready for use. Could live out there! You probably know this……i have been told by several friends pine oil, as in Pinesol, is quite toxic to cats, so please be careful around darling Hobbes! looking forward to seeing your white flowers in a future post. Thanks for sharing and some great tips! Oh my goodness, Yvonne, I love your porch as much as I love your interior (no surprise there). Your porch is wonderful, however mine is a screened-in porch on the back of the house. I love the pillows and rug. I have a rocker that is wood and is branches with a wooden slat seat it was cherry finish but has weathered so much the stain has pealed and I think instead of staining the slats I might paint them. Do you think that is ok, I will leave the branches natural for they are the rocker part and I love the natural dark gray. What color do you think might me good or should I strip and stain? Erica I think painting your rocker really sound so fun and whimsical! But remember that it will have a very different look. If your rocker is dark grey why don’t you try a pretty navy or even cobalt blue. LOVE blue and gray together! If you are really feeling daring tangerine would be fabulous against the grey!!!! Girl, you have such great outdoor areas. We have to rebuild our deck and hubby thought we could just flip the boards over and next to the sun room we found lots of rot! He worked till 10 Sunday night after finding that and now it has rained ever since and will continue through this weekend so just fixing the rot has been put on hold. Not sure when the deck will get done. Always something with an aging home. Your home is amazing Kim! And your deck is too! I know what you mean about an aging home! Upkeep, upkeep, upkeep! At least it gives us lots to post about! Beautiful!! Can I ask where you got the galvanized pots? And are those swirly things sticking out and stick of some sort. I just love that look and want to copy it exactly. You might want to give this new generation of rugs a try. I got mine from Ballard and leave them out all winter and they are perfect! It would be worth a try! 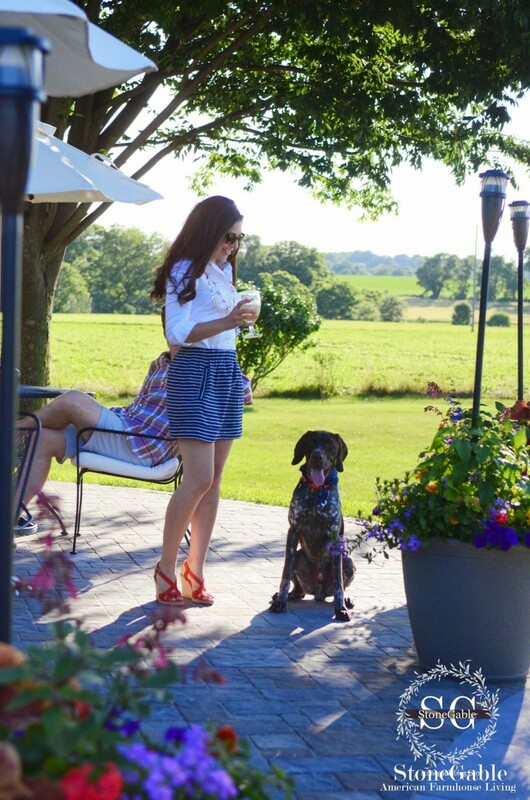 Oh, dear friend, I totally agree with your 8 amazing tips to perk up the deck!!! So~o~o desperately needed are our April Showers. . .but I can’t leave my cushions and pillows out at this time!!! All in due time. . .all in due time!!! Oh how I would love to start getting the wrap around porch ready, but it is way too soon here! If I do it now it would have to be completely redone as the pollen invasion turns everything green. We aren’t really safe until the start of June. I do start washing what I can, painting it, and then wrap it so the pollen doesn’t get on it. Love your colorful furniture. I stick with the white wicker and blue cushions and let the flowers provide the rest of the color. It fits in with the beach where we live. After this terrible winter, I am anxious, but it will be all for naught if I do it now. I’ll take a chance on planting a few pots in May, but have to be ready to bring them in if we get a cold snap. I will look at those solar torches, thank you! Just start doing things that you CAN do now so it’s not so much work later on. We get pollen and farm dirt, but once I scrub off the winter grime it’s easier to clean what Spring brings! I just look so forward to reading your letter everyday! Your yard and home is beautiful,,Yes,we ahd our room painted yesterday,I am in love with the “fresh” look,, What is your suggestion for a bedspread or comforter,,the room is called Swiss coffee,a clean,clean white,,O’I am in love!! THanks so much Tina! Your room sounds… well, yummy! Almost any color comforter will work with white. Yvonne, you have created such comfortable and welcoming outdoor spaces. Will you please share a link for the specific solar Tiki torches? 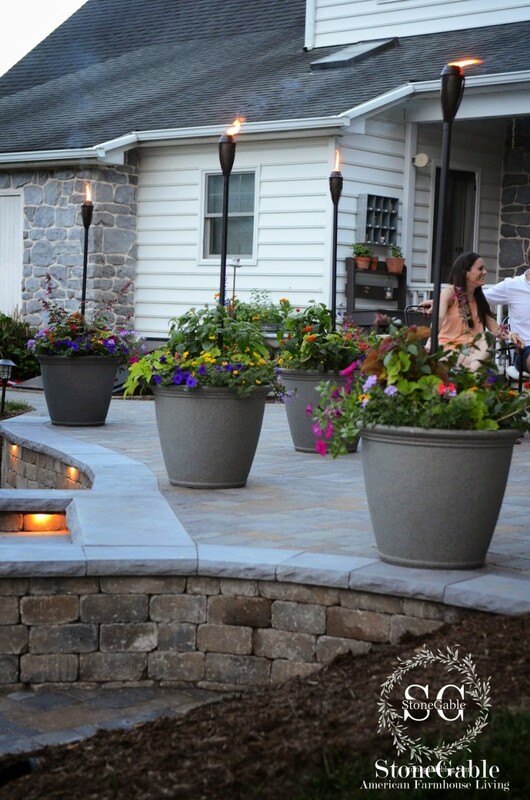 I love how you used the torches in planters, surrounded by flowers! Hi Sally! I check on Tiki Brand and did not find the flame and solar torches. But I did find them on Amazon. You might want to check there. I just bought a couple more! Lovely! I just finished doing my porch for spring too! Love the curtains…..but I fear our southern humidity would not like them. Just finished sweeping this morning and OMG….the june bugs!!! there were hundreds of them on the porch this morning and are staining my just cleaned areas….aaaaacccckkkkk! 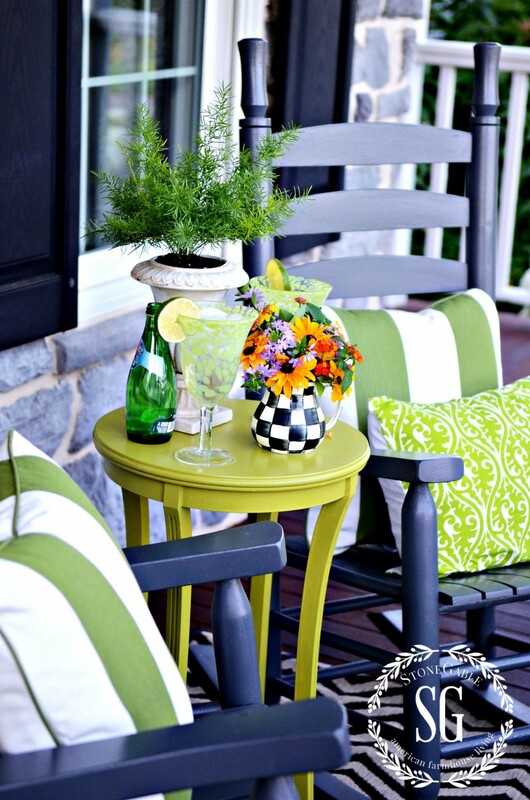 I used the lime green color too this yr with a Mackensie vase as well!!!!! Janey, We have horrible humidity here too! My drapes do just fine. Actually the humidity helps them to hang well! Thanks for all the great ideas to make our outdoor spaces enticing. When you paint your rockers, do you use spray paint? If so what kind? I just retired in January and am looking forward to sprucing up the outdoors and enjoy! Hi Marie, These rockers were painted with a paintbrush. Spray paint would work just as well. Enjoy retirement!!!!! Thank you. Will probably tackle the spray paint. Speechless and breathtaking!!! Love all your ideas. We are finally experiencing some sunshine and warmth here in Minnesota. Can’t wait to get started! Yvonne, your porch and patio looks absolutely GORGEOUS!!! 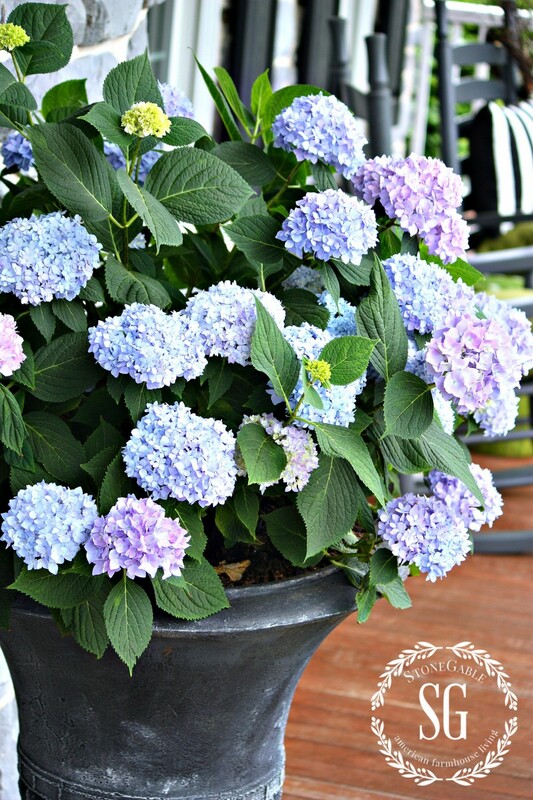 I used hydrangeas on my front porch this year too! Great tips! Look forward to your post everyday! What hydranga do you recommend for large pots? Where do you suggest I shop to find the tiki SOLAR lights? Sound like a perfect addition to my established garden! what color do you paint your porch ceiling? Why this shade? Yvonne, I remember that last year you mentioned a nursery near you that will fill you pots for you. Would you please share their name. I’ve already planted my pansies but would like some help with the summer flowers. If you go tell them I sent you! Thanks! What color is the paint you used on the rocker. Love your porch. Thank you. Hi Debbie, It was Country Grey from Lowes. Hope this helps! Beautiful!!! Could you provide your sources for everything…pillows,paint, curtains, containers, etc. Oh my goodness! The pillows came from Ballard Designs and Costco. The curtains came from Pottery Barn (end of summer sale a few years back) Containers from local shop- Stauffer’s of Kissel Hill and from Costco. Hope this helps! Thank you so much for the quick response. 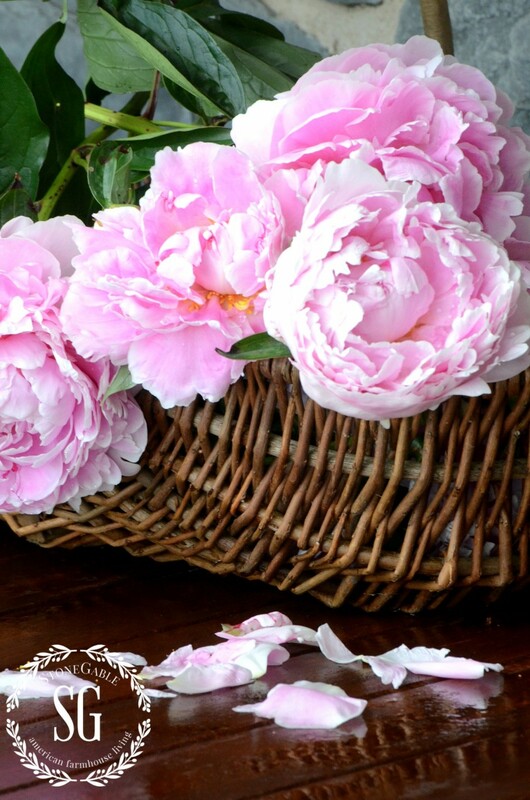 I think I want you to come over and “prettify” my porch and yard! All looks wonderful! I don’t have a porch, but I do have a deck, any ideas? Use the same principles. I think decks are the most wonderful outdoor spaces! Define them by using a rug and group furniture if you deck is big enough. Love the outdoor curtains! Do you use a special fabric? LOVE your ideas! I’ve seen great outdoor curtains using drop cloths! Just might give this a try! What a wonderful space you have Yvonne! I would love to use curtains on my porch or deck but my husband puts the nix on that! 🙂 I to am in the mood to use whites this year and I love you suggestion of using whites in your container gardens. Have a wonderful week! Everything looks so coordinated. This year I plan to make things match and look like new. I’m tired of things looking kinda worn out. 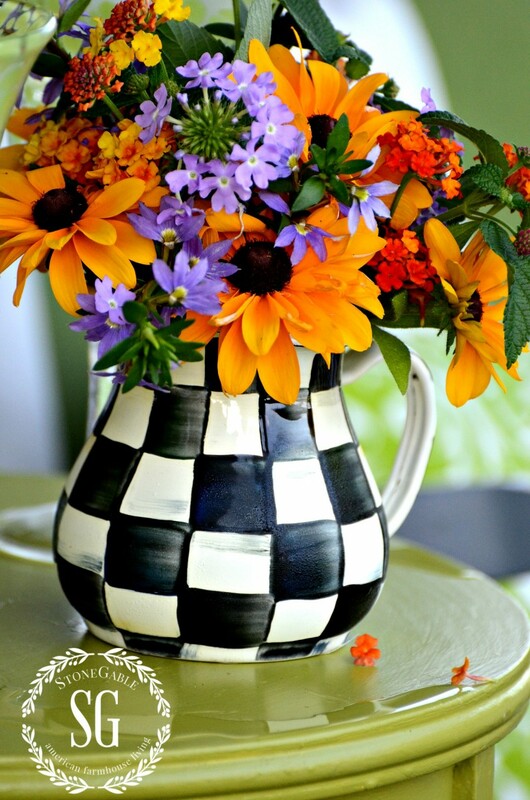 I love your pitcher of flowers! We moved 2 years ago into a house that has a deck. I’m trying to make it inviting and a place to sit and read in the nice weather. I do want to incorporate some solar lighting but am being mindful about what you said about LED lights not giving a warm glow. Still working on that. I will definitely plant lots of flowers. We were out in Lancaster County last week and saw the most beautiful geraniums….still way to early for here. 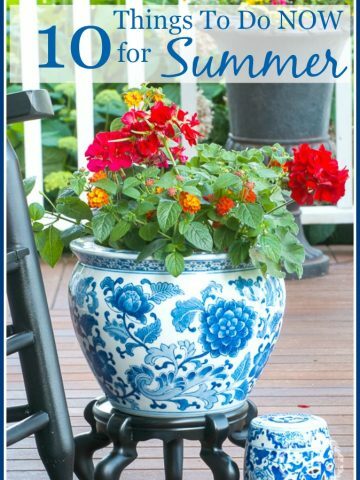 I love your large planters and might try that this year instead of the groups of small pots I usually plant. Just love your ideas and the way you pull it all together!